Chaz Davies will be hoping to celebrate another podium this weekend, but needs to test shoulder issue. Chaz Davies is hopeful he will resume his World Superbikes campaign in Portugal this week despite a shoulder injury. The Knighton-born rider refractured his right collarbone in a training accident at Aragon during the two-month summer break from racing. Davies had suffered the injury at the start of the break which forced him to miss his Ducati team’s Race of Champions at Misano. The 31-year-old recovered to take part in the test at the Portimao track before re-injuring himself while training. Davies will test out the shoulder at the track on Friday before deciding his weekend plans. The 31-year-old said: “The collarbone injury was just not ideal, but I felt progress during these days, which is the most important thing. “We’re going to see how Friday goes and then take it step by step, without rushing things too much early on. “I’m pretty sure I’ll be OK once I step on the Panigale R, but we need to make sure we build our way into the round and avoid potential bumps on the road before the actual races. Davies resumes the campaign second in the standings on 278 points, but 102 points behind reigning three-time champ Jonathan Rea with 200 left to race for. But Dutch rider Michael van der Mark is just 30 points adrift in third place so Davies will be keen to race if he wants to bag a third runners-up spot of his World Superbikes career. 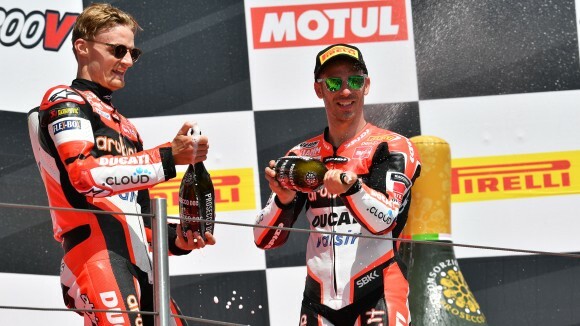 Davies has already agreed on a deal to stay with his aruba it Racing team until 2020 and will debut the new Ducati bike next season.